The Pakistan Cricket Board (PCB) has urged the International Cricket Council (ICC) to take strong action against the Indian team for wearing army camouflage caps during the third ODI against Australia in Ranchi. Speaking to reporters at the National Stadium in Karachi, PCB chairman Ehsan Mani asserted, "We have strongly taken up the matter with the ICC. There is absolutely no misunderstanding in the ICC about our position. We believe that cricket and sports should not be used for politics and we have said this very clearly. Their (India's) credibility in the cricketing world has gone down very badly." 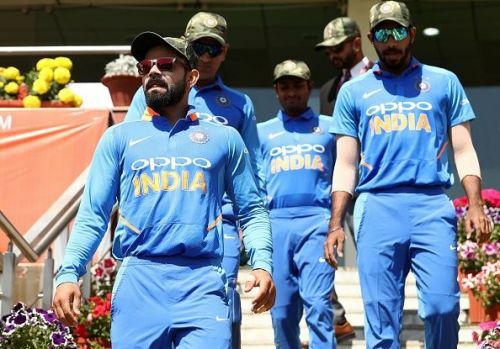 In order to pay their respects to the CRPF personnel who had lost their lives in the Pulwama terror attack, the Indian team wore camouflage caps for the entirety of the Ranchi ODI and donated their match fees to the National Defence Fund. This was aimed at helping the families of the CRPF martyrs take care of education and other expenses for their children. Pointing to the examples of England all-rounder Moeen Ali and South Africa leg-spinner Imran Tahir, the PCB called for ICC to take notice of the Indian team's gesture at Ranchi and insisted that Virat Kohli's players acted contrary to the prior permission from the apex body. During the 2014 Southampton Test, Moeen came out to the field wearing wristbands containing the words 'Save Gaza' and 'Free Palestine'. He was subsequently warned by the ICC to not wear such wristbands. In a T20I against Sri Lanka during 2017, Tahir took off his South Africa jersey after taking a wicket to reveal a t-shirt containing the image of the then deceased singer and religious preacher Junaid Jamshed. He was reprimanded by the ICC for breaching the regulations revolving around clothing and equipment. PCB chairman Ehsan Mani affirmed, "You have two examples from the past already, where both Imran Tahir and Moeen Ali were sanctioned for something similar. The ICC had taken strong action against them and we have sought similar action against India. The permission they took was for a different purpose but they acted differently." He added, "We have been in touch with ICC from day one, sent one letter already and another is being followed up in the next 12 hours. There should not be any ambiguity as we are taking this very strongly. We don't do politics, neither we do we use cricket for politics." The ICC has announced that the BCCI had taken prior permission for their players to wear army camouflage caps on the field. With the PCB now launching an official complaint, it remains to be seen if this case takes a different turn.